Cadet boots lightweight assault version Top gun. 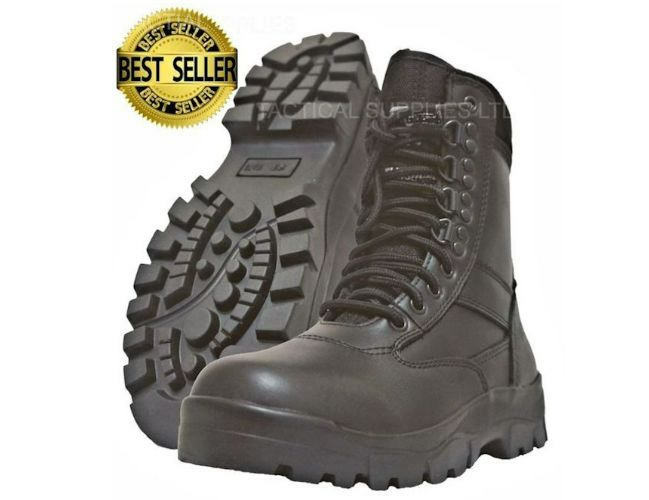 The Grafters Top Gun Police and Cadet Boot is a good all Leather patrol boot, it is lightweight and durable and is suitable for people who are on their feet a lot. It is constructed from strong action leather and rubber sole units. The boots gives good protection to the ankles, and along with the steel shank in the sole gives that little bit extra support. Another good feature is the toe bumper, heel box, padded tongue and speed lace system for speedy use. The sole unit is one of the best qualities of this boot as it is oil resistant and gives impressive non-slip capabilities. The lining of this Cadet and Police boot is thinsulate for warmth retention and wicking action to keep the feet dry. Allways try and look after your boots by keeping them clean and well aired. This is one of our best boots at the price. Good quality and few returns. A great cadet boot and you can buy with confidence.